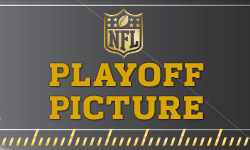 NFC Playoff Picture: Who wants the NFC East? Published: Dec. 15, 2015 at 02:11 p.m. Updated: Dec. 17, 2015 at 03:46 p.m. When Gregg Rosenthal broke down the AFC Playoff Picture, he told the tale of a conference packed with drama. With three weeks to go, the situation in the NFC is less cloudy, but there's still plenty to unpack coming out of Week 14. New York's win over the Dolphins on Monday night turned the NFC East back into a wild maze of confusion. With the Giants, Eagles and Redskins all notched atop the division at 6-7, only the moribund Cowboys (4-9) can be dismissed -- and not even mathematically. Facing the Jets, Bills and 'Skins, Dallas could win out and take the crown if the rest of the division utterly imploded or were snatched away by an angry alien mothership. The Giants face a rugged slate against three teams still battling for playoff seeding, beginning Sunday with the Panthers. Can Odell Beckham pull off the impossible against Josh Norman and Carolina's rugged defense? Redskins vs. Bills in Week 15 is fascinating, with two of the league's most unpredictable teams going head-to-head. Washington has a chance to take over the East if New York and Philly -- facing Arizona -- fold the tent against the NFC's two best clubs. Brass tacks: We have no idea who wins this thing. Just sit back, grab a cold one and watch this glorious mess unfold in real time. Photo finish in the North? Here's another division that could wind down to the final minutes of Week 17. The Packers (9-4) sit one game ahead of the Vikings (8-5) with tilts remaining against the Raiders, Cardinals and Vikings. Minnesota must deal with the Bears and Giants before that finale in Green Bay. The Vikings were dealt a rugged schedule down the stretch and have lost three of four. Banged up on defense, they gave Arizona a fight last Thursday night, but it wasn't enough. That defeat along with losses to the Packers and Seahawks over the past month tell us all we need to know about the Vikes: Good team, not great and maybe a year away. Green Bay has problems of its own, but coach Mike McCarthy took over the play-calling Sunday and willed his offense to shove the ball down the throat of the Cowboys. That kind of balanced offense makes the Packers a load to deal with in the NFC, but they're still not the same team that came within seconds of the Super Bowl last January. One final note: If the regular season ended today, the Vikings and Packers would repeat their Week 17 showdown the following week in a Lambeau-based wild-card clash. That happened in 2012, too, with Minnesota hosting and beating the Packers in Week 17 before falling to Green Bay on the frozen tundra a week later. Not likely. Sunday's loss to the Saints all but buried a frisky Bucs team that sits two games behind the Vikings in the wild-card hunt. Tampa (6-7) remains alive with games against the Rams, Bears and Panthers, but getting in would require a massive Minnesota collapse because we don't see the Seahawks taking a step back. The Falcons (6-7) are still breathing, according to mathematicians, but we consider them a floating corpse. As of today, the Seahawks (8-5) would travel to Washington for the wild-card round as the NFC's fifth-seed, all but vaulting Seattle into the NFC's divisional round. The Panthers (13-0) and Cardinals (11-2) are legitimate NFC strongholds, but neither club wants the white-hot 'Hawks for their opening playoff challenge. Carolina fans can't help but think back to 2013, when the Panthers put together a brilliant season only to be dealt the surging Niners -- and losing -- at home in the divisional round. This year's team is worlds better, but Carolina's road to Super Bowl 50 could be a bumpy one. Panthers coasting to No. 1? From another angle, Carolina has blown up doubters all season, turning every suspected trap game into a celebration of what the Panthers are: A legitimate title contender. We asked last week if the Cardinals might have the juice to take over the No. 1 seed, but that would require Cam Newton's club to fall on their face in remaining games against the Giants, Falcons and Bucs. It's much more likely they roll into the playoffs as an undefeated beast. Arizona's schedule is trickier, with tilts against the Eagles, Packers and Seahawks. The Cardinals haven't flinched all season, but things would get interesting if they fell to Seattle and Green Bay, while the Packers won out, leaving both teams with identical 12-4 records.